Who's taking the biggest cut? Last week, the OECD released the latest edition of its "Taxing Wages" report which focuses on the net personal average tax rate in different nations. It takes into account income tax and social security contributions paid by employees without family benefits as a share of gross wages. Last year, the average share of gross wages paid in tax across the OECD was 25.5 percent. There is a considerable difference in tax rates between countries and they are heavily dependent on earnings and family status. 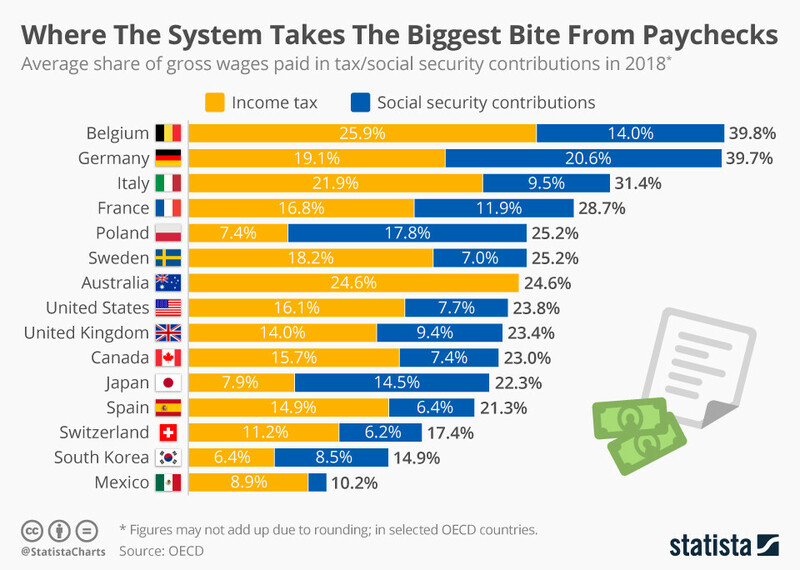 A single worker in Belgium and Germany will face a high combination of income tax and social security payments that will account for just under 40 percent of his or her gross earnings. Despite that, workers in both countries do get something back such as health insurance, pensions, old-age care and unemployment benefits. In Italy, the break down is 21.9 percent for income tax and 9.5 percent for social security, adding up to 31.4 percent in total. The U.S. trails with 16.1 percent for income tax and 7.7 percent for social security making for 23.8 percent of gross earnings in total.